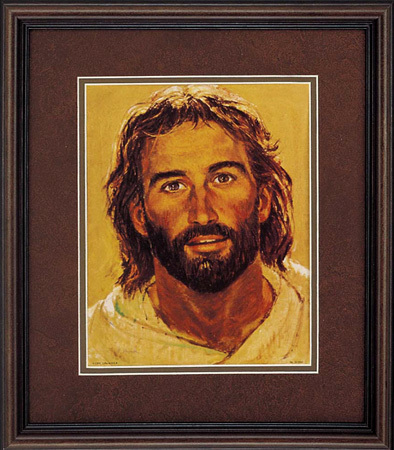 Find great deals on Jesus art by artist Richard Hook by clicking on his individual art titles. Put our art gallery to the test by shopping around and comparing various prices, knowing that our Price Match Guarantee will let you purchase Richard Hook art at the lowest possible prices guaranteed! Head of Christ and other artwork by artist Richard Hook can be viewed in our artist slideshow. 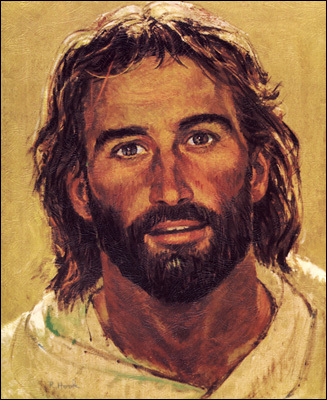 Head of Christ or Surfer Jesus by artist Richard Hook and other Richard Hook art, art work, artwork, canvases, giclees, images, limited editions, open editions, paintings, paper, pictures, posters, and prints can all be found at Christ-Centered Art. 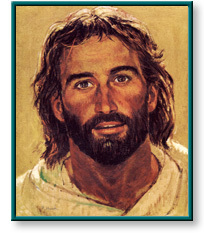 Head of Christ depicts a portrait of Jesus Christ — a carpenter from Nazareth and the Son of God. Image Size 3.875" x 2.5"
Add $3 for shipping & handling. Purchase a second print at half price! Add $7 for shipping & handling. This unframed open edition paper print comes textured and mounted and is ready to frame. Add $8 for shipping & handling. Add $9 for shipping & handling. This framed open edition paper print has an image size of 10" x 8". It comes in a walnut finish frame with black shading and is double matted with an auburn mat on the top and a light brown mat on the bottom. Hanging hardware and glass are included. This sturdy cardboard puzzle comes with 54 interlocking pieces. Head of Christ by artist Richard Hook as well as other open and limited edition Jesus paper art prints and canvases, giclees, images, lithographs, paintings, pictures, posters, and reproductions by renowned Concordia Publishing House artist Richard Hook can be viewed and purchased at special sale prices at Christ-Centered Art.